The moment when you catch your first glimpse of the awe-inspiring Machu Picchu is simply unforgettable, and for many this is the reason to visit Peru. But there is so much more to this diverse country. Spend time with the locals during a homestay at Lake Titicaca, watch condors wheeling over the Colca Canyon and unwind in the tranquil sacred valley on this journey through ancient lands. We have planned one departure to coincide with the Inti Raymi celebrations in Cusco. The 'Festival of the Sun' was a religious ceremony during the Inca Empire, and is now one of South America's largest pageants. Arrive Lima and check-in at hotel. This morning we transfer back to the airport and fly to the beautiful city of Arequipa.This afternoon is left free for you to explore and acclimatise. This morning we visit Santa Catalina Convent, a miniature walled town which once housed 450 nuns and serving ladies in total seclusion. The rest of the day is free to explore this beautiful city, situated at 2380m and surrounded by snow-capped mountains including the perfect conical peak of El Misti (5822m). Arequipa is famed for it's colonial architecture and the arcaded city square, dominated on one side by the twin towered cathedral (1612), is among the finest to be found in South America. We head north today where we enter the world of the Altiplano, passing behind the volcanoes that ring Arequipa and on to Chivay. There are herds of llama and alpaca en route, and if lucky we may spot the elusive vicuña. Today we briefly reach the highest point of our trip at 4,910m where we stop for a photo before descending towards Colca Canyon. We have an early start this morning to the Colca Canyon. A spectacular river gorge, the Colca Canyon measures twice the depth of the more famous Grand Canyon and at one time it was believed to be the deepest gorge on earth (until it was eclipsed by the deeper Cotahuasi Canyon). Largely unknown to the outside world until the latter years of the 20th century, today it affords us an opportunity to discover a world of Andean villages and Inca terraces that make up one of the most outstanding natural settings in the Americas. This is the world of the Altiplano, where the Rio Colca meanders through a landscape of towering volcanic peaks that offer a stunning backdrop to a land inhabited by Cabana and Collagua Indians. Home to the massive and majestic Andean Condor, these awe-inspiring vistas derive their name from the old Incan practise of storing harvested grain in natural vaults carved into the canyon walls, vaults that the Indians called colcas. This afternoon we drive east, via the Patapampa pass again at 4910 m, heading towards the beautiful landscapes that surround the unique waters of Lake Titicaca, the highest navigable lake in the word (3856m). Our destination is the town of Puno, a centre of Incan folklore nestling in a bay at the northwestern tip of the lake and the perfect base from which to explore something of the cultural and historical significance of the lake itself. 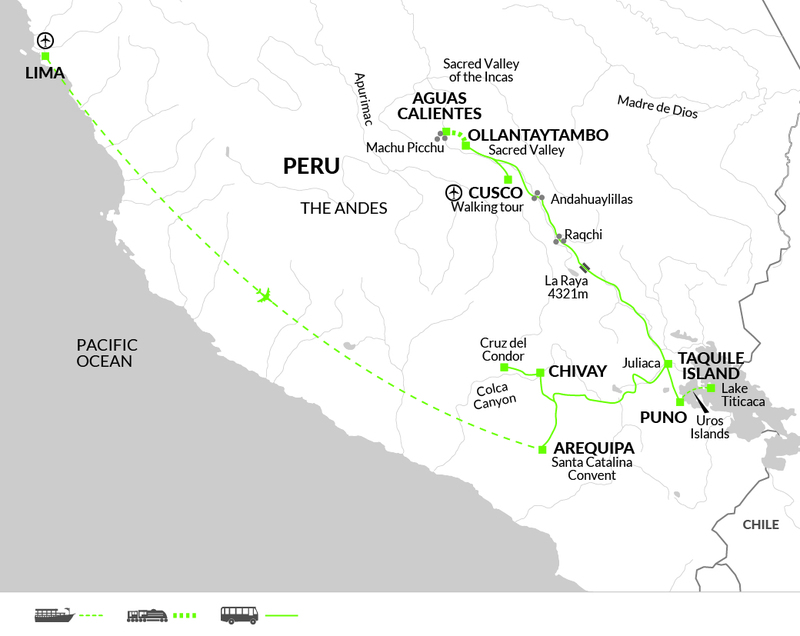 Today we follow the legendary route taken by the first Inca ruler - Manco Capac - on his way towards Cusco. Our destination is in the Sacred Valley at Ollantaytambo. Setting off from the hotel at around 5.30am, we take the scenic journey in our public coach. Driving up to the northern limit of the Altiplano we cross La Raya pass (4,335m) and descend to Cusco. Depending on time, those who wish may visit the colonial church at Andahuaylillas or the Inca temple ruins at Raqchi. The scenery is desolate but magnificent and we may spot flocks of llamas and alpacas grazing on the windswept pastures. We arrive into Cusco in the late afternoon, and from here drive to the Sacred Valley, heading towards our hotel for the evening. Today is a free day with a wide choice of things to do. For river-lovers there is a the opportunity of a raft-trip down the Urubamba in the Sacred Valley of the Incas (optional and seasonal). This is an exciting way to see the valley and no previous experience of rafting is necessary - full instruction and safety equipment are provided. There is also the opportunity to visit Misminay, home to many of the porters who work along the Inca Trail and within the valley itself. We can learn a little more about the lives of these descendants of the ancient Inca during our visit. Alternatively you could visit Maras and Moray where hot springs at the top of the valley have been diverted into seriously impressive terraced saltpans. Ollantaytambo itself is also worth spending time in; during the Inca Empire it was the royal state of Emperor Pachacuti who conquered the region and built the town as a ceremonial centre. We take an early morning train along the side of the Rio Urubamba, flanked by high cliffs and peaks, towards the mountain town of Aguas Calientes. Once a tiny village of no more than a few houses, this town throngs with travellers and trekkers coming to-and-from the famous 'lost' city of Machu Picchu. After dropping bags at our hotel, we climb by bus to the ancient site at 2,400m. The existence of this exquisite masterpiece of ancient civilisation remained unknown to the outside world until it was 'discovered' by an American archaeologist, Hiram Bingham, in 1911. We explore this mountain-top stronghold - the most spectacular feat of engineering in ancient America. Returning to the valley floor, we stay in a simple hostel in Aguas Calientes, with the chance to soak in the nearby natural hot baths. Later we take the afternoon train to Ollantaytambo from where we get the bus to Cusco. The old capital of the Inca Empire survives only in its ruins, imbued with an atmosphere of mystery and grandeur. The Spanish colonial city, with its attractive pink tiled roofs, arcaded plazas and steep winding alleyways, stands upon tremendous Inca foundation stones. This morning we take a walking tour of this lovely city to see important Inca and colonial monuments, such as the Plaza de Armas, the Koricancha and the Inca wall of Hatunrumiyoc with its famous twelve-sided stone. The stone, measuring some 5 feet across, has the typical bevelled joints which create the patterns of light and shadow on Inca walls. We also visit one of the outlying Inca sites - Cusco's temple-citadel, Sacsayhuaman which broods high above the town, its huge, zigzagging stone walls broken into 66 sharply projecting angles to catch attackers in a withering crossfire. 20,000 conscripted workers toiled for 90 years to finish it. Today has been left free for you to enjoy the wonderful atmosphere in Cusco's old town and perhaps do some souvenir shopping in the winding streets and alleys of the city. Your trip ends this morning in Cusco after breakfast. Puno - Raqchi entrance US$4, Andahuaylillas entrance US$4, Titicaca Train £220, subject to availability and cost may fluctuate depending on demand. This must be pre-paid at time of booking and is non-refundable. If you change your passport between your time of booking and prior to travel please take your original passport with you to avoid being fined. Aguas Calientes - Hot Springs US$4. Machu Picchu - Second entry US$70 plus bus US$25 (bus paid locally) Huayna Picchu Mountain- £80; Machu Picchu Mountain £80 (both including transport) - Subject to availability - these must be pre-paid at time of booking and is non-refundable. If you change your passport between your time of booking and prior to travel please take your original passport with you to avoid being fined. Select your clothing carefully. A complete set of clothes which can get grubby and muddy are useful. Bring warm clothing such as a warm fleece, thermal underwear, warm hat and gloves for cooler nights in the mountains when temps drop dramatically. Lightweight waterproofs are essential. Bring your swimsuit. Comfortable shoes and lightweight walking shoes and sandals. If participating in the rafting, old trainers (as they will get wet). One piece of main luggage, a daypack plus one small bag for your nights in Aguas Calientes and on Taquile Island where you will leave your main luggage in storage. On Taquile, your main bag will be left in Puno while you stay on the island for one night. In Aguas Calientes, your main bags will be left in storage in your hotel in the Sacred Valley for the two nights and will meet you when you arrive in Cusco. A good insect repellent is essential. Also bring a small torch, sun hat, sunscreen, a swimsuit and a small towel (for rafting and thermal baths). Please note drones are prohibited in most tourist areas in Peru. 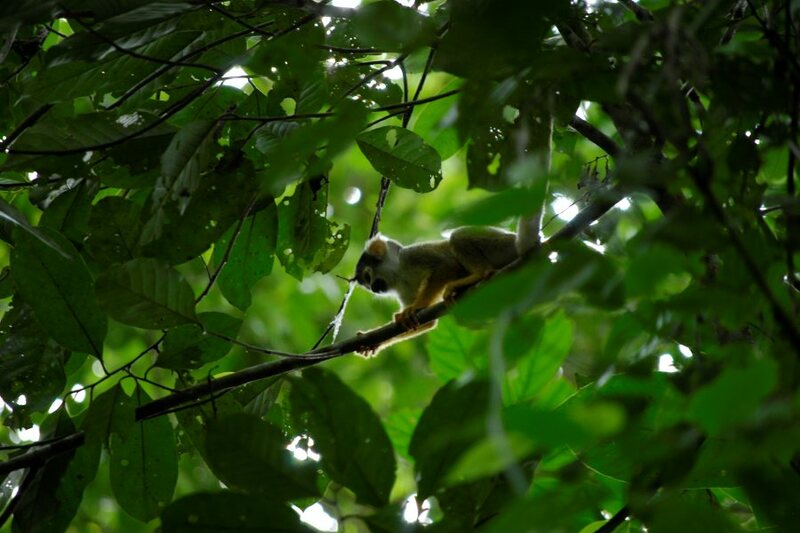 Why not extend your visit to Peru with three nights in the Amazon Jungle? Click here for details. We have planned one of the dates of this tour to coincide with the Inti Raymi celebrations in Cusco. The 'Festival of the Sun' was a religious ceremony of the Inca Empire. It is now celebrated every year in Cusco and is one of South America's largest pageants.